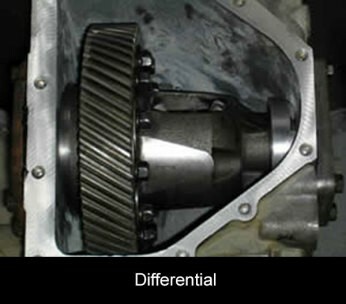 A differential is an arrangement of gears that divides the torque of the drive line between the axle shafts and allows them to rotate at different speeds. Power flow through the differential is as follows: The drive pinion rotates the ring gear. The ring gear rotates the case. The pinion shaft, as it rotates with the case, forces the pinion gears against the side gears which in turn rotate the axles. If a vehicle were always driven in a straight line the axles could be fastened directly to the ring gear as both wheels would always turn the same speed. However when turning a corner, the outside wheel has to travel farther than the inside wheel. This requires the outside wheel to turn faster so the pinion gears do a balancing act and allow the inside wheel to slow down while the outside wheel speeds up. While turning a corner the outside wheel may do 110% of the vehicle speed while the inner wheel does 90%. What Causes Damage to Differentials? A lot of damage to differentials is caused by being stuck and spinning one wheel for an extended period trying to get unstuck. If one wheel is on good traction and not turning, the wheel on poor traction is spinning at 200% which puts undo stress, wear and heat on the pinions and serious damage can result. The most essential part of rear differential service, as with any mechanical repair, is the proper diagnosis of a problem, and in axle work, one of the most difficult areas to diagnose is a noise. Locating a broken axle shaft or broken differential gear presents little or no problem but locating and isolating a differential noise can be an entirely different matter. Any gear driven unit, and especially an automotive drive axle where engine torque multiplication occurs at a 90 degree turn in the drive line, produces a certain amount of noise. A normal amount of noise must be expected and cannot be eliminated by conventional repairs and/or adjustments. However if there is an abnormal amount of noise from the differential area it is wise to have it professionally checked and serviced as it would normally indicate a progressing problem. At National Transmission we have experience repairing damaged differentials with success. Call us today for differential repair or service in the Calgary area.